The nonlocal behavior of quantum mechanics can be used to generate guaranteed fresh randomness from an untrusted device that consists of two nonsignalling components; since the generation process requires some initial fresh randomness to act as a catalyst, one also speaks of randomness expansion. R. Colbeck and A. Kent [J. Phys. A 44, 095305 (2011)] proposed the first method for generating randomness from untrusted devices, but without providing a rigorous analysis. This was addressed subsequently by S. Pironio et al. [Nature (London) 464, 1021 (2010)], who aimed at deriving a lower bound on the min-entropy of the data extracted from an untrusted device based only on the observed nonlocal behavior of the device. 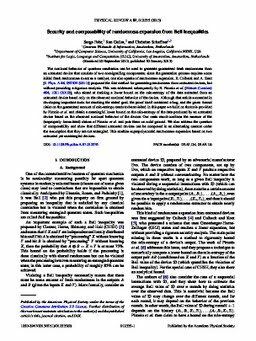 Although that article succeeded in developing important tools for reaching the stated goal, the proof itself contained a bug, and the given formal claim on the guaranteed amount of min-entropy needs to be revisited. In this paper we build on the tools provided by Pironio et al. and obtain a meaningful lower bound on the min-entropy of the data produced by an untrusted device based on the observed nonlocal behavior of the device. Our main result confirms the essence of the (improperly formulated) claims of Pironio et al. and puts them on solid ground. We also address the question of composability and show that different untrusted devices can be composed in an alternating manner under the assumption that they are not entangled. This enables superpolynomial randomness expansion based on two untrusted yet unentangled devices.